SALEM, OR -- Governor Kate Brown won re-election Tuesday, defeating Bend State Representative Knute Buehler by about a 5% margin. But, just a handful of counties carried the vote. 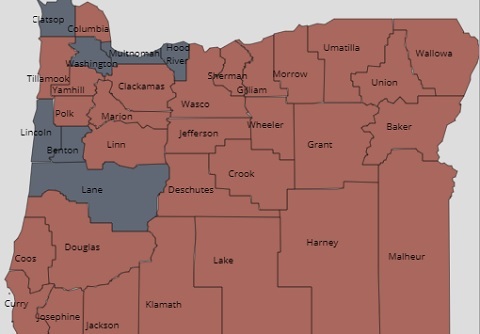 Multnomah, Washington, Clatsop, Hood River, Lincoln, Benton and Lane counties went to Brown; the other 29 counties went to Buehler. KBND Political Expert James Foster says Brown must now figure out how to lead a divided state. "[We have] A deep, deep urban/rural split; we have a deep, deep east side/west side split, and so it’s very difficult to see how she is going to play in – or, we can predict how she is going to play in the red counties." He tells KBND News, "What’s going to drive her agenda? Is it going to be driven by the many counties in eastern and southern Oregon that she lost? Or is it going to be driven by the Portland to Eugene corridor?" Buehler’s term in the state House will end in December but Foster doesn’t think that will be the end of his political career, "Smart money is that he’s an ambitious and talented person and he’s going to be around for a while." This was the second time Brown has defeated Buehler. In the 2012 Secretary of State's race, Brown won re-election by a 9% margin.